Never done before anywhere in the world: disc brake hub set (front) of less than 100 grammes. With just 99 grammes we now have the most lightweight disc brake hub in the world. Incidentally, also one of the most rigid hubs ever too, thanks to the large diameter of the hub housing. Furthermore we introduced a rather revolutionary disc placement: the six cut out, dirt collecting "lobes" are completely absent. The bearings have an extra seal by means of two rubber rings around the 15 mm hollow axles. This extra sealing provides an even longer lifespan of the bearings. Like al our lightweight parts, the hubs are laser engraved with the M5 logo, and have been anodised black or red. 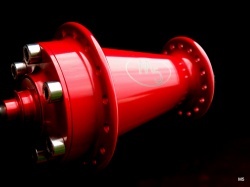 This set of hubs combines excellent with those splendid, new designed 40 mm high ATB rims by M5! M5 fronthub "straight pull version", the LIGHTEST fronthub in the world! The new developed light weight hubs are completely manufactured from alu 7075-T6. 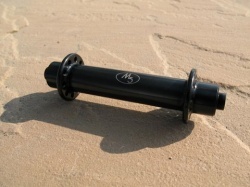 Like other lightweight components from M5, the hubs are also developed with the FEM method. There's a body weight limit for the M5 flanged hubs of 75 kg. For the straight pull hubs the bodyweight limit is 100 kg. Further on there is a max.spoke tension for the front hubs of 80 kg. No radial spoke pattern for the front flange hubs. In black anodised 7075-T6 aluminium, in 16, 20 or 24 holes. The 16 hole version is just 36 grammes, the 20 hole is 44 grammes and the 24 holes just hits 46 grammes. That's the weight of a light type quick release! M5 front hub "flanged" version, the LIGHTEST fronthub in the world! The new M5 flange front hubs (anodised and laser inscribed) are now available from stock in 16, 20 and 24 spoke versions. The flanged versions are at an incredible low weight of only 33 gram for all drillings! Also available with ceramic bearings, add 42 Euro, ex VAT! To illustrate how light weight these hubs are: the M5 flanged front hub weighs the same as two CD's! Without the case! M5 Flanged rear hub, one of the LIGHTEST rear hubs in the world! Another sample of "light and yet rigid": the M5 flanged rear hub. Weight from 170 grammes. Available in 20,24 and 28 holes. This hub is also made from alu 7075-T6 and like the light weight crankset it's build with the FEM method. The axle is 15 mm in diameter and has quadruple bearings. Available with 20, 24, 28, 32 and 36 holes. Life span of 100.000 km. In case of a 28 inch wheel with a circumference of 2.1 meters this is equal to 47,600,000 revolitions. Stress Ratio (Min. Stress / Max. Stress) is bigger than 0.5. Based on this life span and Stress Ratio the maximal tensions may not exceed the 348 MPa . When ordering, please state your wishes in the shopping card remarks field. Picture right: tension area's are made visible by means of colour differences. Blue being the lowest intensity and red the highest.